Thread snap gages are also called a thread calipers. Thread snap gages are only used for checking external threaded parts. Thread snap gages are available in either a Knife Edge Style or a Roller Style. The front set of gage members are a complete GO gage. 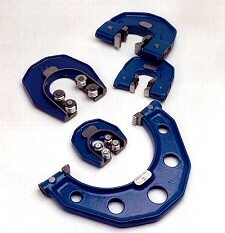 The components should pass through the GO rollers under their own weight or with the very slightest of pressure. Under no circumstances should any force be used to assist entry. No element of a screw which passes through the GO members can be too large. The rear gage members constitute a NOGO effective diameter gage, the threads being cleared away at the crest and root. Standard thread forms such as UN Series and Metric Series are readily available. Non-standard forms such as Trapezoidal, Buttress, Acme, Whitworth, and others are also available and of course are priced accordingly. Multi-start threads may also be gauged using thread snap gages. There are some lead-diameter combination limitations. Be advised that a GO thread ring gage is the very best tool to check an external threaded part for a functional fit. So, if a GO thread ring gage is the very best tool to check a part for a functional fit, why even talk about thread snap gages? Because they have some advantages that should be considered when deciding which tool to use to measure your parts. The Thread Snap Gage is ideal for gauging components produced in high volume in all types of material. They check parts faster than GO/NOGO ring gages. Thread snap gages have a GO and a NOGO portion similar to thread ring gages. Thread snap gages are used just like plain snap gages. To use thread snap gages, apply the part to the gage by sliding it into the gage from the side of the part thread. The increased speed of inspection comes from this sliding action which replaces the screwing action of thread ring gages. The part is passed through the GO segments. Assuming that it does in fact pass the segments the first part of the part inspection is completed. The part is then attempted to be passed through the NOGO segments. At this point the hope is for the part not to pass through the segments. If it does pass through the segments the part has failed the inspection process. Thread snap gages do not wear out as fast as thread ring gages. Thread ring gages wear rather quickly because of the contact friction of the gage against the part through the entire helical path of the thread gage application, and then again through its removal. Snap gages will wear less than ring gages because the contact with the part being measured is momentary and only at two points on the part. Knife edge thread snap gages will wear faster than roller style thread snap gages. The knife edge contact is a dragging action where the roller style is a rolling contact which has low interactive friction. Regardless, both styles of snap gages are much longer wearing than ring gages. Thread snap gages especially lend themselves to gauging components manufactured from soft alloys such as stainless steel, aluminum, bronze and brass where the problem of adhesion or galling of the alloy to the thread ring gauge can be experienced when using thread ring gages. This is again because of the minimal contact that the gages have with the part being measured. Also, the threads on the gage members of thread snap gages are annular and of corrected form so that there is no interference caused by the helix angle of the thread being gauged. The gauge frames are typically made of cast iron and are sometimes coated in an epoxy resin coat, which gives the gage a high level of protection from accidental damage which may occur if the gage should be dropped, or of any other type of accidental impact. They can be used to detect: out-of-roundness; malformed major diameter; radius at root oversize; pitch error; and taper. To identify an out-of-round condition, pass the part through the gage twice. On the second pass, present the part rotated 90° from the position of the first presentation. If the part is out-of-round to a point of being out-of-tolerance an oversize or undersize condition will be found. To identify various other errors use the snap gage as a form of optical comparator. This can be done by placing a reflective material, like a piece of ordinary white paper, between the GO and NOGO rollers. Then with the aid of a light source, and the work piece between the GO members, defects in the piece should be detectable. See the samples below for the type of errors detectable and an example of what they may look like.